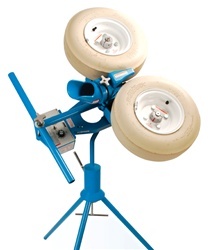 The JUGS Curveball Baseball Pitching Machine has established itself as the most popular and widely used pitching machine in the world. No other training device has so radically improved the practice procedures of a sport. With the patented "gooseneck" design, The JUGS Curveball Pitching Machine allows you to throw any type of pitch: left- or right-handed curves or sliders, straight or rising fastballs-- even sinking "split-finger" fastballs. This machine can accommodate the practice needs of baseball players of all ages. With a quick and easy speed adjustment, it is simple to mix up the pitches. This machine is also easily adjustable to simulate both left- and right-handed pitches. With speeds from 20-104 MPH, its great for any player.